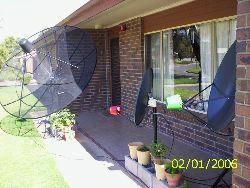 Here are pictures of my Ku band dish on tripod pointing at Optus B3 satellite for receiving a pay satellite TV signal. 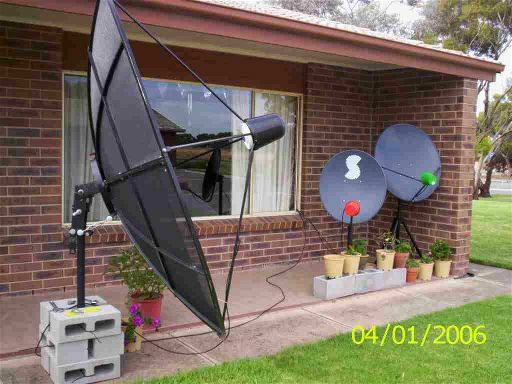 The bigger Ku band dish is pointing at Optus B3 at 152�E while the smaller one is pointed at Panamsat 8 at 166�E. 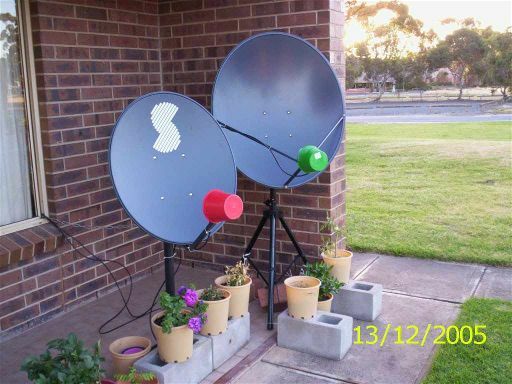 I live in an Australian country town of Roseworthy near Adelaide, Australia. 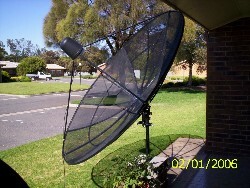 My C band dish on a portable metal post pointing at INSAT 2E at 83.5�E to receive FTA TV channels from India. I set these up myself using your dish pointing AZ-EL calculator. Thank you. I am sending the pictures in response to your request in your dish pointing calculator. 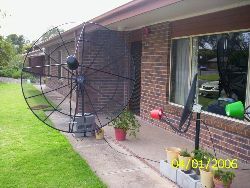 Many thanks to you for providing lot of kind technical support through your website and the satellite internet chat board. A view of the earth from a position along the geostationary orbit. ► Many thanks for the pictures, Eric. 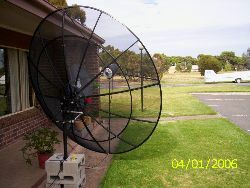 All pages on this satsig.net web site are Copyright Satellite Signals Limited � 2005 all rights reserved. Page created 15th April 2006, last amended 17th Dec 2014, Amended 4 August 2015, 20 Jan 2019 HTML5.